During the past two years (June 2013–May 2015), 70-something climate experts have gathered at the UNFCCC and reviewed (a) the adequacy of the 2 °C (3.6 °F) warming target and (b) the global progress to realize the climate goal. This month, they published their conclusions. The following 10 messages are the gist of the conclusion report. "There's still a chance, although time is running out fast." I hope this cliché sentence will finally become the last of its kind this year. The world is looking up to COP 21 in Paris (November 30–December 11, 2015). Meanwhile, you can check out your country's progress at the Climate Action Tracker. Parties to the Convention agreed on an upper limit for global warming of 2 °C, and science has provided a wealth of information to support the use of that goal. Despite the irreversibility of global warming, cutting carbon dioxide (CO2) emissions now affects future warming within a few years. Removing CO2 from the atmosphere results in cooling. Adding other limits to the long-term global goal, such as sea level rise or ocean acidification, only reinforces the basic finding emerging from the analysis of the temperature limit, namely that we need to take urgent and strong action to reduce GHG emissions. However, the limitations of working only with a temperature limit could be taken into account, for example, by aiming to limit global warming to below 2 °C. Scenario analysis shows that limiting global warming to below 2 °C implies the following: a large reduction in global greenhouse gas emissions in the short to medium term, global carbon dioxide neutrality early in the second half of this century, and negative global greenhouse gas emissions towards the end of the twenty-first century. The longer we wait to bend the currently increasing curve of global emissions downward, the steeper we will have to bend it, even with negative emissions. Limiting global warming to below 2 °C necessitates a radical transition (deep decarbonization now and going forward), not merely a fine tuning of current trends. The global climate determines regionally experienced risks. While global assessments of climate risks inform global policy choices and global risk management, they should be complemented by regional and local perspectives. A key element of these perspectives is the value judgment of when the scale (e.g. frequency and severity) of climate impacts results in a transition from ‘acceptable’ to ‘unacceptable’. This leads to a greater appreciation of the role played by all decision makers, including subnational authorities and cities. Significant climate impacts are already occurring at the current level of global warming and additional magnitudes of warming will only increase the risk of severe, pervasive and irreversible impacts. Therefore, the ‘guardrail’ concept, which implies a warming limit that guarantees full protection from dangerous anthropogenic interference, no longer works. This calls for a consideration of societally or otherwise acceptable risks of climate impacts. Limiting global warming to below 2 °C would significantly reduce the projected high and very high risks of climate impacts corresponding to 4 °C of warming, which is where we are headed under a ‘business as usual’ scenario. It would also allow a significantly greater potential for adaptation to reduce risks. However, many systems and people with limited adaptive capacity, notably the poor or otherwise disadvantaged, will still be at very high risk, and some risks, such as those from extreme weather events, will also remain high. Adaptation could reduce some risks (e.g. risks to food production could be reduced to ‘medium’) but the risks to crop yields and water availability are unevenly distributed. Moreover, the risks of global aggregated impacts and large-scale singular events will become moderate. The ‘guardrail’ concept, in which up to 2 °C of warming is considered safe, is inadequate and would therefore be better seen as an upper limit, a defence line that needs to be stringently defended, while less warming would be preferable. The costs are manageable, even without taking into account the co-benefits of mitigation, and various policy options could be deployed to manage the risks of the necessary mitigation action. The feasibility of the long-term global goal could be assessed in an emerging, iterative, global risk management framework that has multiple feedbacks from different sources and takes into account planetary boundaries. To this end, periodic reviews would provide an opportunity to assess and reassess the overall progress towards reducing risks of climate impacts and progress of mitigation and adaptation action, thereby contributing to a science-based risk management of the pathways to a low-carbon and climate-resilient future. A generally accepted metric exists for aggregating and measuring overall progress on mitigation, but no single metric exists to quantify and aggregate the overall progress on adaptation. Similarly, a widely accepted metric to measure overall progress on reducing risks of climate impacts by adaptation would be required in the context of a global risk management framework. Greenhouse gas emission growth has accelerated, reaching a record high during the decade 2000–2010. The Cancun pledges are only consistent with the long-term global goal with pathways that require a much higher mitigation response later. Moreover, policies in place have had a limited impact on bending the emissions curve downward. However, successful mitigation policies have been identified and progress is being made on scaling them up, in particular in relation to putting a price on carbon and promoting otherwise low-carbon technologies, so that their share becomes dominant. We need benchmarks for sound climate policy in the light of national circumstances. National information was not made available in a balanced manner for consideration by the structured expert dialogue, but such information could be considered in future reviews. Many of the technologies required to achieve the long-term global goal are already available, but their deployment is not on track. Various barriers to their deployment and transfer have been identified. There is no widely accepted definition of climate finance, and uncertainties remain in the tracking of climate finance flows, in particular for adaptation finance and private finance, and to a lesser extent also for mitigation finance. Discussions are ongoing in various processes under the Convention regarding the resources required to address climate change under emission scenarios that limit the temperature increase to below 2 °C. Institutions and processes launched under the Convention on technology and capacity-building have built a foundation for much greater effort, and progress has been achieved in the operationalization of the Green Climate Fund. The level of action now needs to be increased on all fronts. The science on the 1.5 °C warming limit is less robust than for the 2 °C warming limit or warming beyond this limit. Consequently, assessing the differences between the future impacts of climate risks for 1.5 °C and 2 °C of warming remains challenging. More scientific findings are likely to become available in the future, and considerations on strengthening the long-term global goal to 1.5 °C may therefore have to continue. Nevertheless, limiting global warming to below 1.5 °C would come with several advantages in terms of coming closer to a safer ‘guardrail’. It would avoid or reduce risks, for example, to food production or unique and threatened systems such as coral reefs or many parts of the cryosphere, including the risk of sea level rise. On the other hand, this implies a more pronounced reliance on negative emissions with associated risks, including those from land-use change, as well as increases in mitigation costs in comparison with the 2 °C warming limit, and requires a larger temperature overshoot, which also carries certain risks. However, while it is unclear whether the difference between 2 °C and 1.5 °C of warming is really only a matter of a gradual increase in risks or also includes some non-linear effects, as some evidence from the palaeo-record indicates,a Parties may wish to take a precautionary route by aiming for limiting global warming as far below 2 °C as possible, reaffirming the notion of a defence line or even a buffer zone keeping warming well below 2 °C. Figure 1. The relationship between risks from climate change, temperature change, cumulative carbon dioxide (CO2) emissions and changes in annual greenhouse gas (GHG) emissions by 2050. Figure 2. 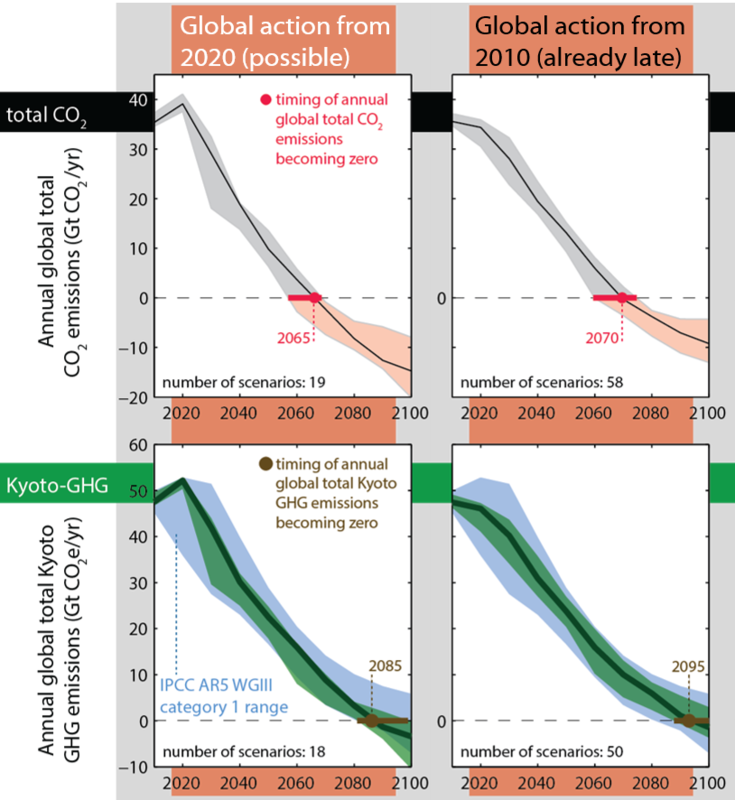 Timings of global net-zero emissions for carbon dioxide (CO2; top row) and greenhouse gas (GHG; bottom row) in two different scenarios ("If we collectively act from 2020" vs "If we had begun the effort since 2010").